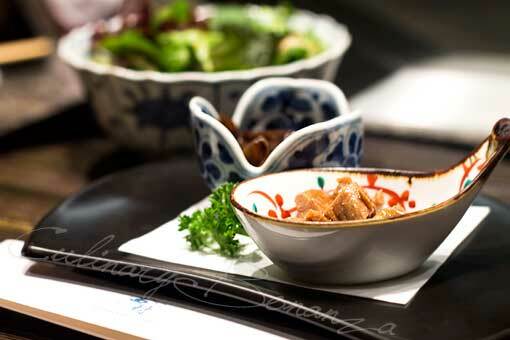 How would you react to a bowl or ramen with IDR 98,000++ price tag? 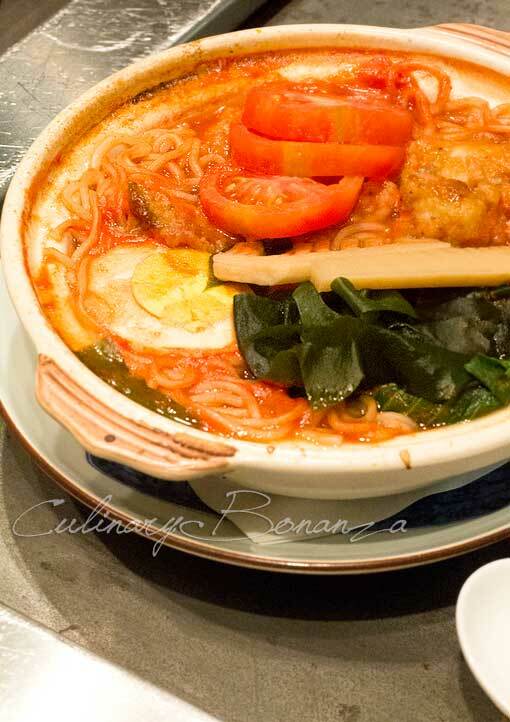 Before you start to lampoon any profanities already at the tip of your tongues, do hear out this fact first: the average price of a ramen bowl in NYC is USD 9.85 (this digit is taken by averaging the 11 best ramen as picked by Serious Eats with prices ranging from USD 7.50 - 14). That's about IDR 97,761, based on the exchange rate on the day I'm writing this post. I know some would still argue that the price is just unreasonable for Jakarta's standard. I stand by my opinion, that Jakarta is as metropolis as NYC gets and the Purchasing Power Parity in the world's capital cities tend to be more or less uniform. Again, touching about economics, scarcity will cause prices to hike up. This 98k ramen is exactly that: scarce. Chef Chomei's ramen may be the most expensive I've encountered so far, but for the quality of imported ingredients and considering the logics I mentioned above, in my opinion, it's all worth it. Nishimura Japanese Chef, Hideki Chomei prepared nothing less than 8 variants of ramen to satiate any type of palates and preferences. 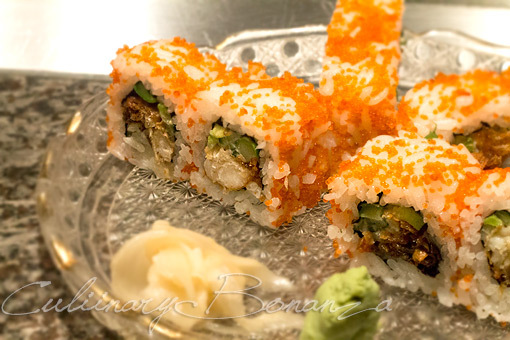 The toppings can be chosen from the chicken, beef, curry (for vegetarian) or seafood. The ramens tasted nothing like the ones I've had at other places such as here, here or here. 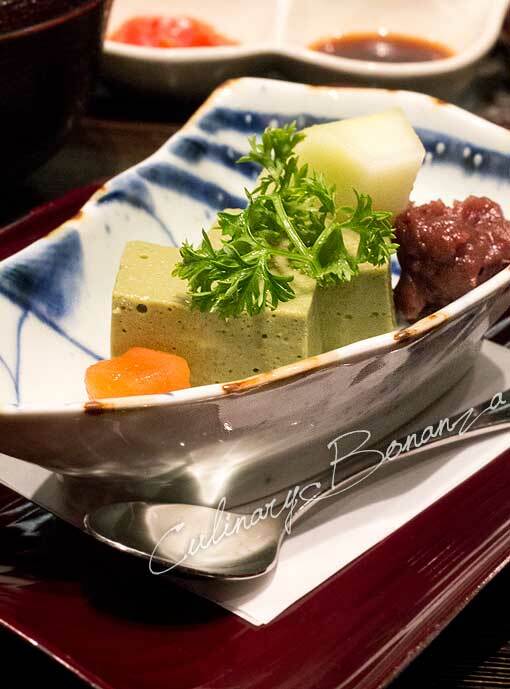 Firstly, the noodles is different, Chef Hideki imported the noodles from Japan and these are not the springy, chewy or thin type, but thicker and more tender. Besides that, the noodles did not appear to be drenched in the broth, my guess is that the noodles absorbed the broth. 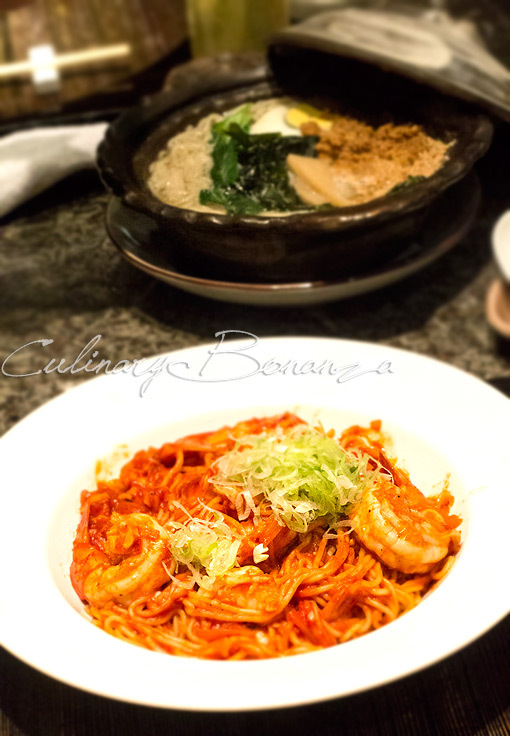 The Ebi Chile Ramen Spaghetti and Tomato Chicken Ramen tasted like spaghetti because of the dominant tomato taste. I tend to like the more savoury flavour, which the Niku Yasai Ramen has. We had the simplest and most classic of Japanese sushi: Jyo Sashimi Moriawase (5 kinds of Sashimi) - tuna, scallop and salmon, etc. Absolutely fresh, it's just too bad that I'm not a massive fan of sashimi. But I was curious with the scallop and it was very fresh. 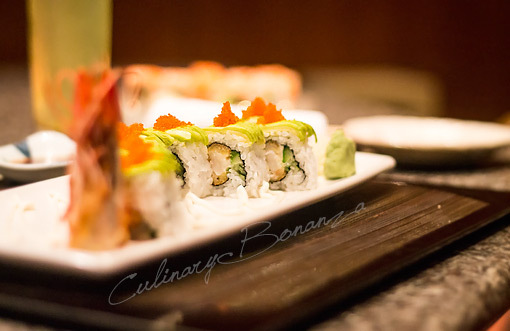 From the Nishimura Specialty Roll: Dragon Roll (shrimp, cucumber, avocado, lettuce, flying fish roe & mayonnaise) & Spider Roll (soft-shell crab, cucumber, flying fish roe & mayonnaise). Soon, a chef appeared in our room and he was going to cook before us, our next dish: Teppanyaki. 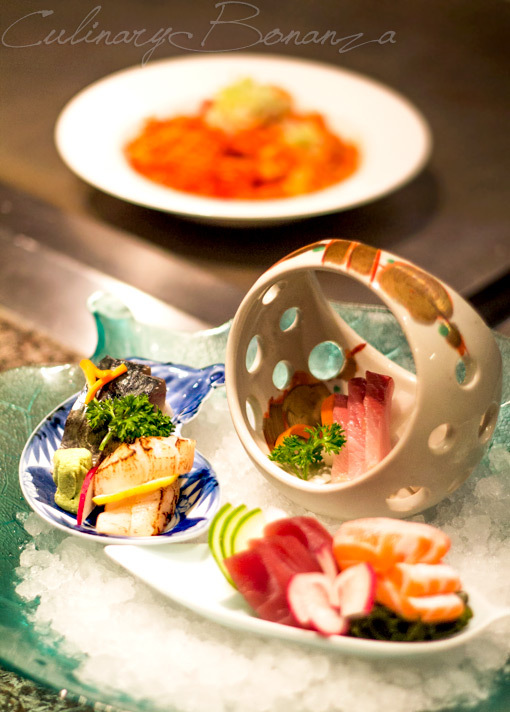 At Nishimura, the teppanyaki is A la Carte Style, pay for what you order. 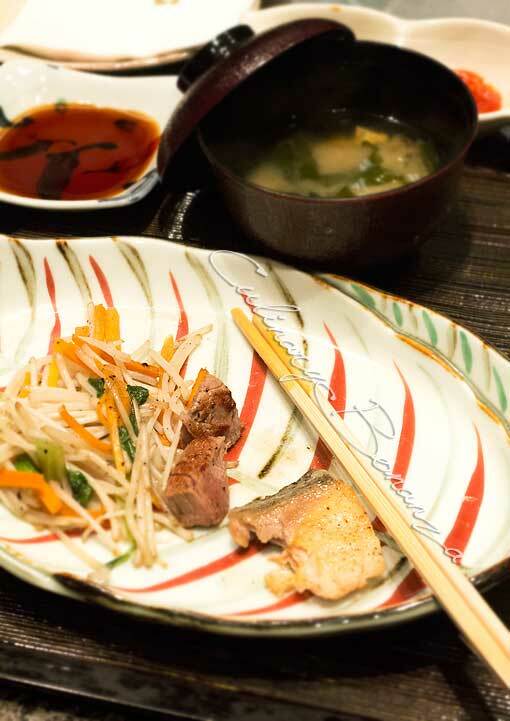 We had King Salmon, Gyuniku Moyashiitame (sauteed beef & bean sprouts) and Yakimeshi (fried rice). 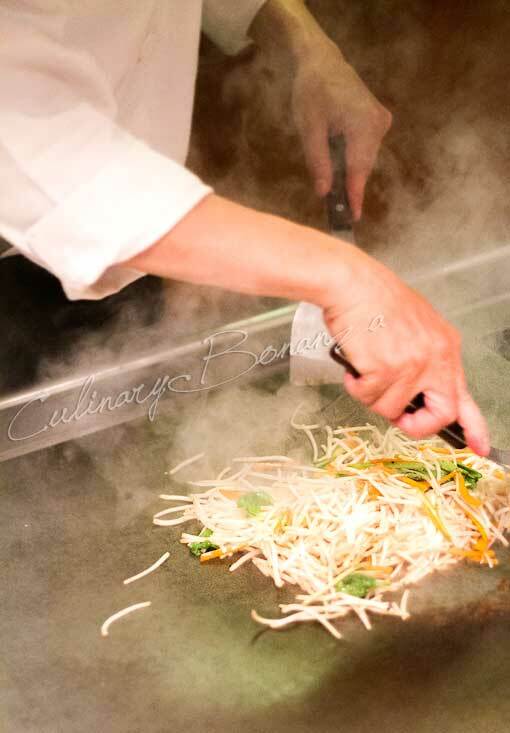 A note when eating Teppanyaki, ladies, make sure to tie your hair up, unless you want your head to smell like a kitchen. From the Yakimono, we tried the Hotate Butter Teriyaki (Grilled Scallop with Butter Sauce). 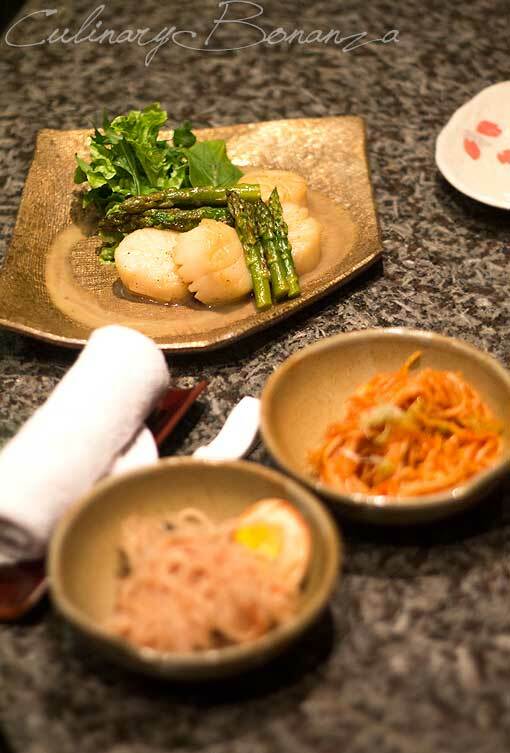 Four pieces of beautifully grilled scallop, comes served with green asparagus and wakame (seaweed). 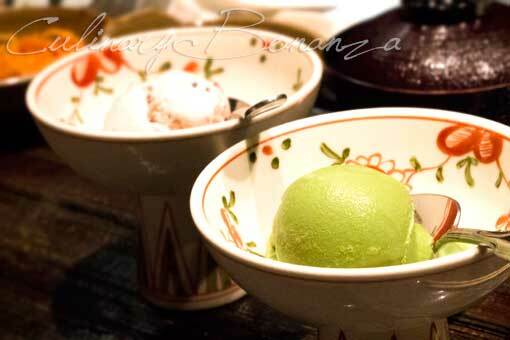 Japanese style dessert: Matcha pudding for and ice cream with ogura and matcha flavours to end the whole deal. Oh, I almost forgot to mention the complimentary salmon skin crackers, which everyone truly enjoyed and even fought for to the last piece. The ramen does look different! n actually, average price of ramen in Syd is like $9-ish if not more. Loving the pics, El, as always! well, i've tried another ramen (wagyu ramen) that costs about 98K too in the neighbourhood cafe&resto, Tangerine, in muara karang area. so i guess this is reasonable enough considering the place, and environment. Wagyu Ramen for 98k! Wow...wonder if the taste is worth it? Create Your Own Noodles Today!